Here we have a 2014 Boston Whaler 150 Super Sport powered by a 60HP Mercury Bigfoot. This boat is equipped with a Raymarine GPS/FishFinder and Fusion stereo system with 2 speakers. It has been garage kept on a trailer. Super clean boat with all cushions and bimini top with boot cover. PACUYS - AYS would love to guide you through a personal showing of this 15' Boston Whaler 150 Super Sport 2014. 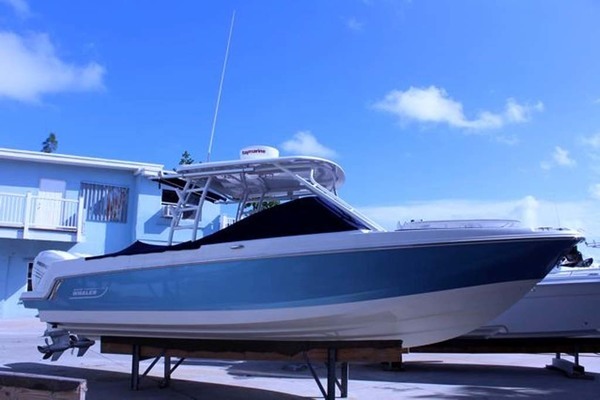 This yacht for sale is located in Pompano Beach, Florida and priced at $17,990. For a showing please contact us by filling out the form on this page and we will get back to you shortly! Whether you are looking for a robust yacht tender or an all-purpose powerboat, the Super Sport can do it all. For boaters seeking full-throttle watersports action, opt for a ski tow or full tow arch and prepare to shred wake. Love to fish but hate cleanup? Add a carry-on livewell, fishing seat and rail-mounted rod holder for fighting the fish---and after a long day on the ocean, lake or bay, just hose it down. The 150 Super Sport's design offers the ultimate in convenience thanks to lots of well-placed storage, comfortable seating, and easy towing. For ease of use, reliability and carefree sport boat style---thanks to stylish gelcoat options---nothing compares to the 150 Super Sport.